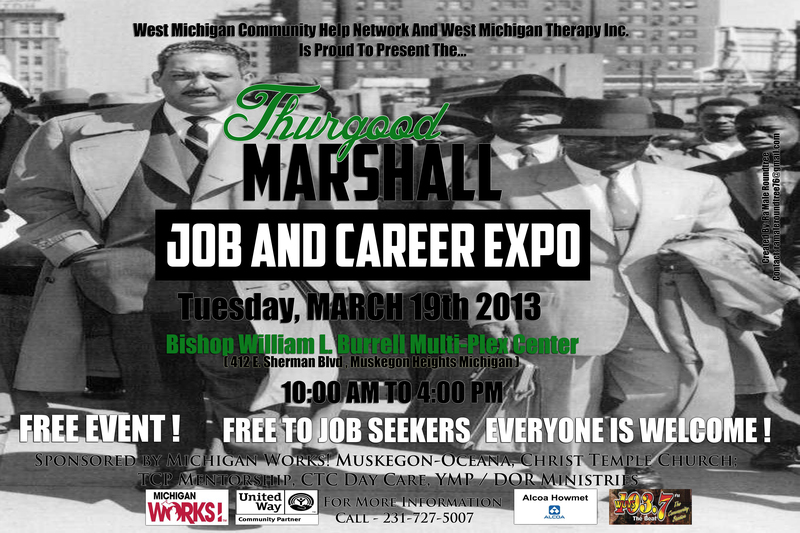 Muskegon, MI (March 14, 2013) –West Michigan Community Help Network is proud to announce the Thurgood Marshall Job & Career Fair Expo coming to the Bishop Williams L. Burrell Multi-Plex Center on March 19, 2013 from 10:00 a.m. – 4:00 p.m. The Thurgood Marshall Job Fair is a public service made possible by a unique partnership of organizations with an interest in promoting economic development in the Muskegon area. This event is free and open to the public. The Thurgood Marshall Job Fair is hosted by the West Michigan Community Help Network in partnership with West Michigan Therapy, Alcoa Howmet, Michigan Works, Muskegon Public School and WUVS 103.7 the Beat. The fair will work with community groups, students, churches, non-profits, senior citizens and other public and private groups that are seeking to find jobs for people with fairness for all, regardless of Race, Creed or Color. Job seekers who attend the job fair range from Entry-Level to Management Level. Residents with diverse backgrounds and experience are expected to attend the job fair. Come explore local job opportunities and meet potential employers. Some of the county’s top companies will participate this year.